After the gluttony of Thanksgiving, does anyone else feel the need to ingest nothing but vegetables for the next couple of days? 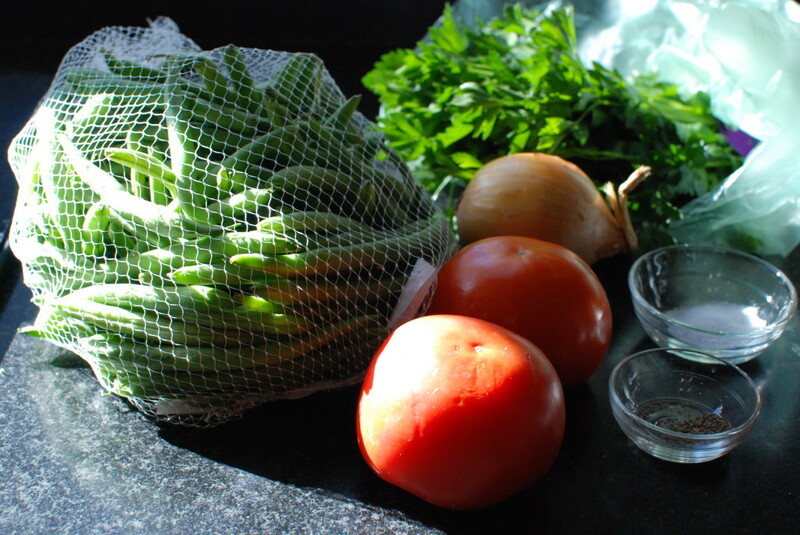 If so, here is a recipe for you — but first you should understand something about Greek vegetables. They are shall we say “cooked through”. Never crisp or crunchy. When we were kids we might have described them as “mushy”, but now that we are all grown up and know better we use the term “velvety” instead. 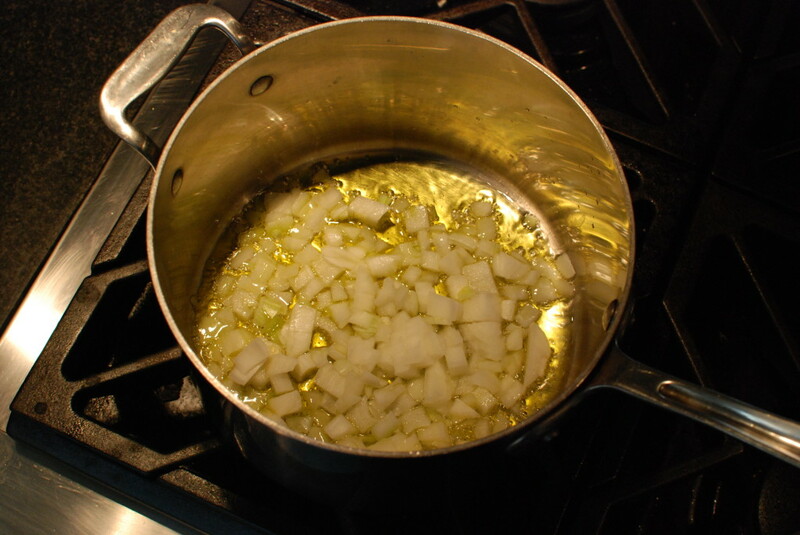 Saute a diced onion in some olive oil until soft. 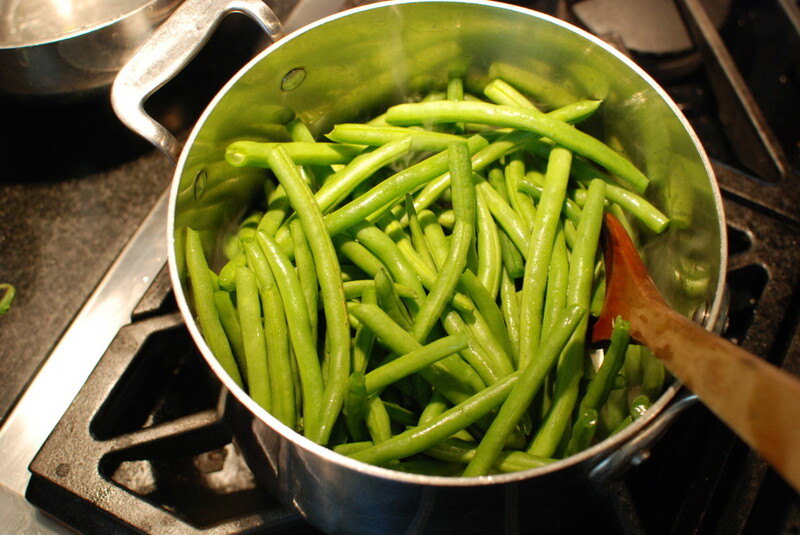 Add the green beans to the pot and sauté for about 5 minutes, then add just a little water and cover. Peel a couple of fresh tomatoes, dice them, and add some salt. Let them sit a bit. Or just use about a cup of canned crushed tomatoes. See the complete recipe below for more about fresh vs canned tomatoes. It’s fascinating. 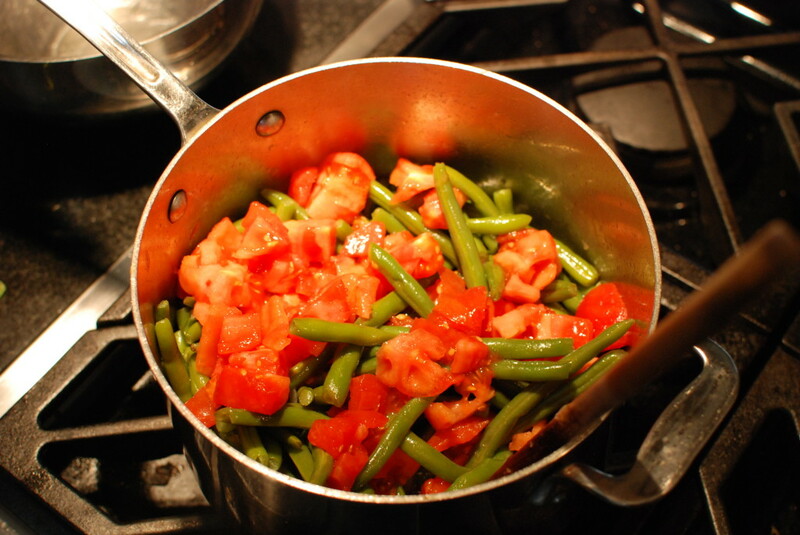 Add the tomatoes to the green beans. Combine well, then cover and cook over medium heat for about 30 minutes. Before serving, sprinkle with fresh parsley. Heat olive oil in a medium pot over medium high heat. Add onion and sauté just until soft. 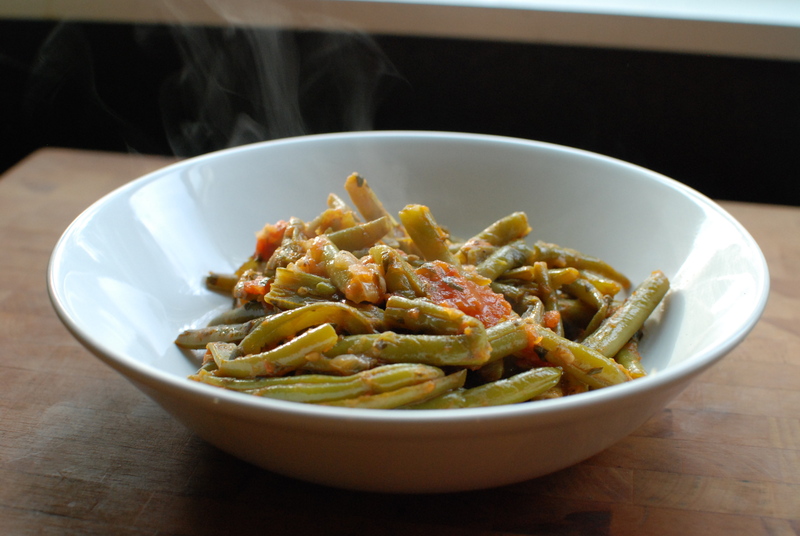 Add green beans and sauté for about 5 minutes, stirring frequently. Add 1/4 cup water and cover. Reduce heat to low and let simmer for about 10 minutes, stirring occasionally. Beans should still have a bit of crunch to them at this point. Add tomatoes. 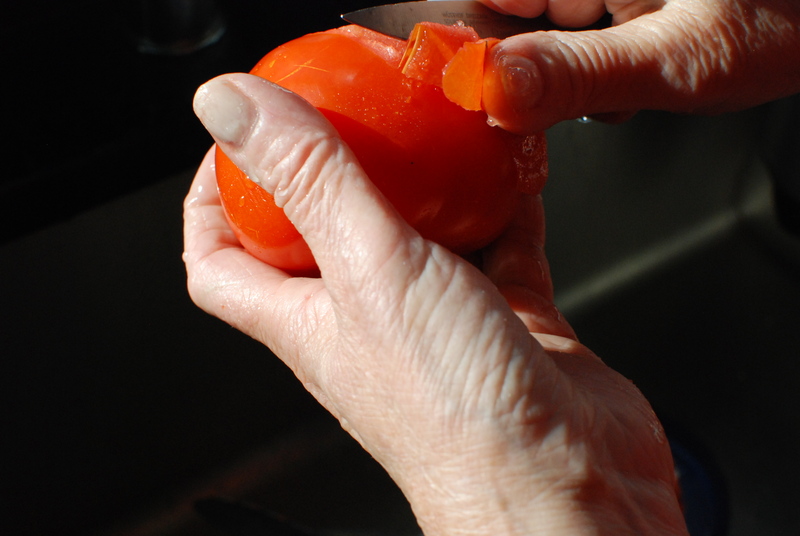 If you are using fresh tomatoes: While beans are simmering, remove skin from tomatoes and chop roughly. Put in small bowl, add salt, stir and let sit for a bit then add to beans. 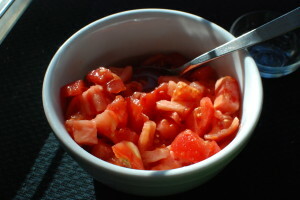 If your tomatoes are not very ripe or juicy, you might want to add a little canned crushed or pureed tomato and a bit of water. We used 2 tomatoes and added 1/4 cup pureed tomato about 1/4 cup water. Might need more or less, depends on the tomatoes. Mom swears that adding fresh tomatoes makes the beans much tastier. Maybe the extra work is worth it when it is tomato season, but if it’s January and the tomatoes are pink and hard as rocks, I would just used good quality canned tomatoes. Cover and cook over medium heat for about 30 minutes or until desired doneness. 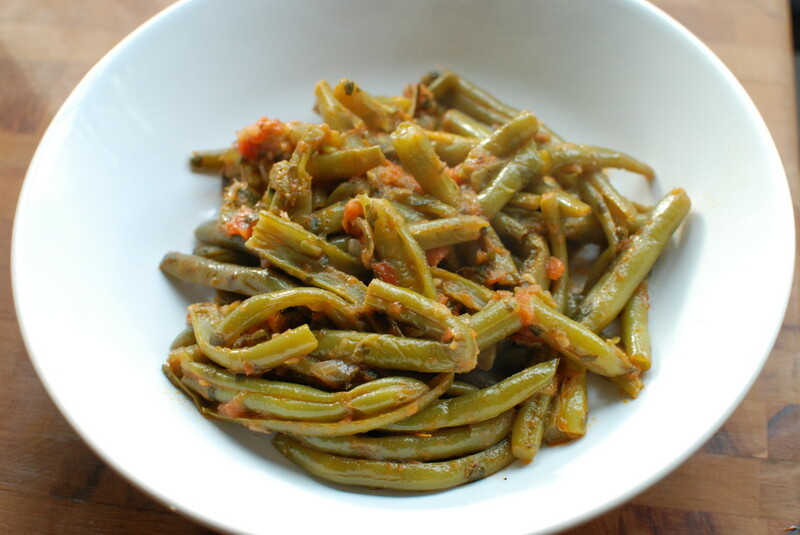 Greek folks like their green beans very soft and tender. Add parsley. Salt and pepper to taste. 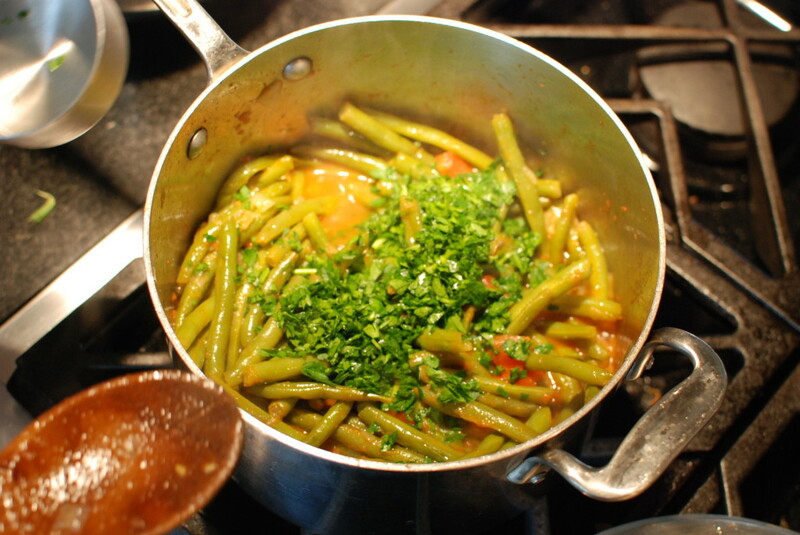 This entry was posted in Greek Classics, Lent, Side Dish, Vegetarian on December 3, 2013 by cousins. This is lovely! The parsley must make the beans so flavoursome!